Sometimes you just don't know what you will see heading to work in the Adirondacks. Frequently, on my way to the office, I wonder how I can ever show my blog readers the cool views I see. These sentiments usually hit in the area just before State Route 73 passes the ski jumps that were used in 1980 Olympic Winter Games. The road curves around a bend that features the Ausable River to the left and a lovely view of Whiteface Mountain directly out the windshield. It is a relatively busy road for the Adirondacks. The speed limit drops to 40 mph right at this spot by the way. 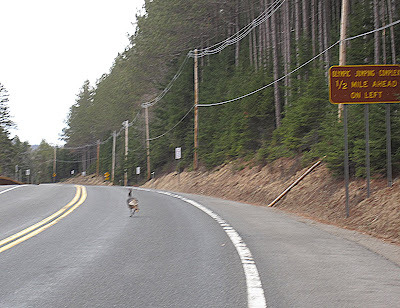 Fortunately, I was obeying the law and paying attention the other day when I encountered this wild turkey running along the road, obviously looking for the ski jumps. We've had a ski jumping moose, and now apparently the turkeys have heard about it and want in on the action. You just never know what you'll discover in the Adirondacks.